The new Royal Alberta Museum which opened its doors last October 2018 houses a large variety of Indigenous artifacts. Some of the artifacts include the Manitou Stone, unearthed tools over thousands of years old. Included among these artifacts are the stories of outstanding Indigenous Albertans throughout history. Muriel Stanley Venne, the president and founder of IAAW is among one of those that are honoured through a display. The new RAM’s feature of Muriel. 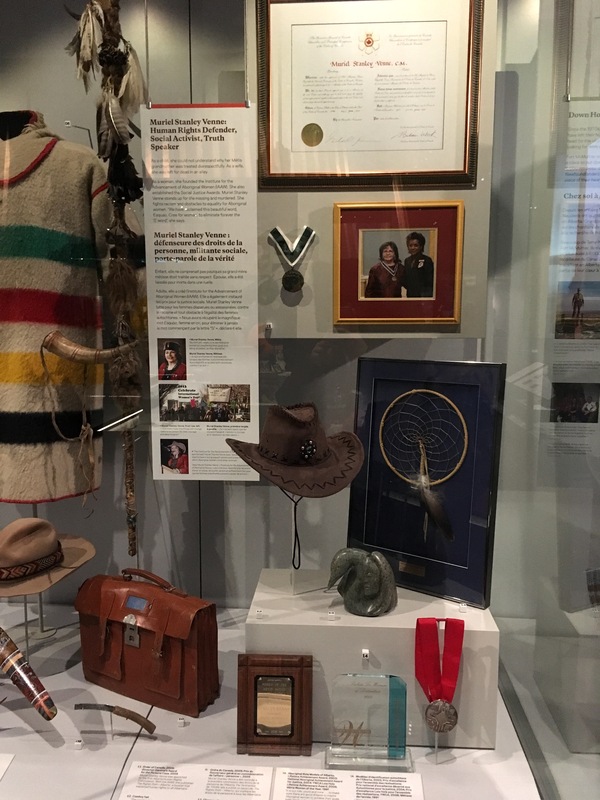 Among the items displayed includes one of Muriel’s signature hats, her various awards for her humanitarian and activist work, and her framed Order of Canada. As a child, she could not understand why her Métis grandmother was treated disrespectfully. As a wife, she was left for dead in an alley. As a woman, she founded the Institute for the Advancement of Aboriginal Women (IAAW). She also established the Social Justice Awards. Muriel Stanley Venne stands up for the missing and murdered. She fights racism and obstacles to equality for Aboriginal women. “We have reclaimed this beautiful word, Esquao, Cree for woman, to eliminate forever the ‘s’ word”, she says. Don’t forget to check Muriel out in the Natural Human History section of the museum! Free entrance is available for First Nations, Métis and Inuit people.